I created these adorable little devils when catering a baby shower recently. Not only are they healthy and dee-lish, but they are super gorgeous and perfect for a brunch appetizer. keeping your heart healthy and brain running efficiently. The avocado helps fight inflammation as well and is known to help with arthritis in particular. No cooking required. Just whisk, cut and assemble. Eat healthy, get happy! Whisk together the vinegar, olive oil and honey. Slice the rind off the grapefruit and orange, removing all the bitter pith. Holding the fruit over the vinaigrette bowl, cut sections out of the fruit (the juice from the grapefruit and orange will drip into the dressing). Then dice the fruit and place in the bowl to soak. Dice the tomatoes and add to the bowl and toss. Slice the avocados in half and remove the pit (see Happy Healthy Tips). Set on a platter. Fill each avocado with a few scoops of the citrus salad. Add sprouts on top. Tear the mint leaves over the platter. 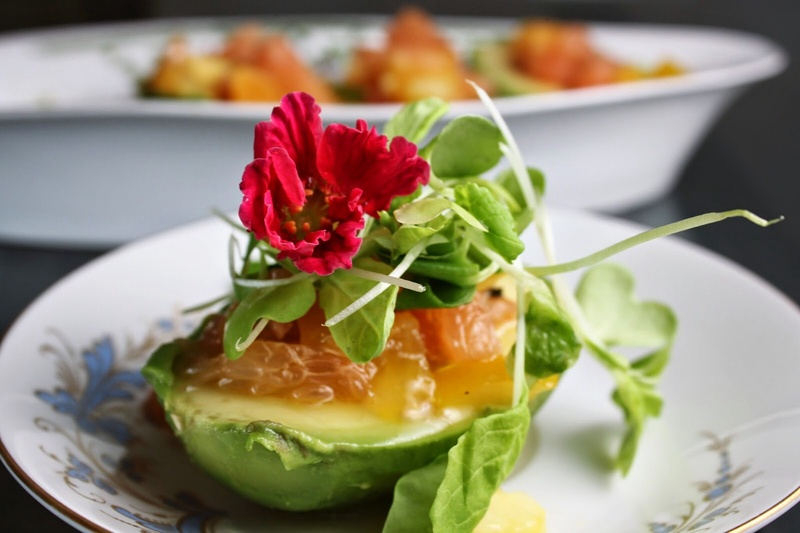 Add an edible flower to each avocado. Add just a pinch of coarse salt and pepper over the top. Use a spoon to drizzle the remaining dressing over it all. Serves 8 with 1/2 an avocado each. Or up to 12: for a larger crowd you can serve salad style by slicing the avocados and arrange on a platter. Then top with all the fixings. Happy Healthy Tips: How to cut an avocado: Cut the avocados in half lengthwise, cutting the knife through the shell until it hits the pit. rotate to slice all the way around. Twist open. Remove the pit by chopping or whacking the sharp side of your knife into the pit and twist it remove. Flick the pit off with your thumb or the side of a bowl or sink.